Green Park Station (via the Jubilee Line, Victoria Line and Piccadilly Line) is the nearest tube station to chambers and is a short walk from Berkeley Square House (approximately 0.2 miles). If you are driving to chambers, please note that chambers is situated in the congestion charge zone. 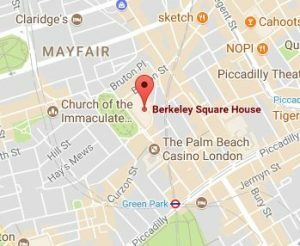 There are parking spaces on meters located around Berkeley Square and the surrounding streets. London City Airport is approximately 30 to 45 minutes drive to chambers subject to traffic (approximately 8.3 miles. Heathrow Airport is approximately 30 to 45 minutes drive to chambers subject to traffic (approximately 13.6 miles). Gatwick Airport is approximately 55 to 90 minutes drive to chambers subject to traffic (approximately 24.4 miles).